For the Star Wars fans, Razer has built a themed gaming headset, which is comfortable and has two 50mm drivers built-in. The headset works on USB and its features can be customized by using the Razer Synapse 2.0 unified software. Besides the volume controls, we can also enable software 7.1 surround via the Dolby Pro Logic IIx and can also customize the included EQ. At first I would like to thank Razer for offering me a sample of their Star Wars: The Old Republic Headset for reviewing. "Razer is more than just the world's leading brand in gaming. We were founded in 1998 in San Diego, California by our CEO Min-Liang Tan and our President Robert “Razerguy” Krakoff in a tiny shared office with a couple other gamers. We have grown today to hundreds of employees worldwide with offices in seven cities, including San Francisco, Hamburg, Seoul, Shanghai and Singapore. Our vision from the very beginning was to be the world's greatest gaming brand and we've set out to achieve that by designing the best gaming products that any gamer has ever seen. We believe that truly great products are based on technology, designed with extensive human factors and user ergonomic studies and then tested by the top professional gamers. In simpler terms, our own world class scientists and engineers develop cutting edge technology in-house or with partners, design phenomenal products around core technologies – and test the hell out of them in the field with our pro-gamers before we launch them. We are the only gaming hardware company in the world with dedicated gaming user interface research and development labs, and our technology and designs are incubated in three dedicated design centers located in facilities in California, Singapore and Shenzhen. No other company boasts of technology like we do – because we're the only guys who have what it takes under the hood. We tell it like it is: some can pretend to co-develop products with professional gamers, but gamers don't develop technology: scientists and engineers do (and ours just happen to be gamers as well). We develop and design our products in our own labs and then put them to the test with top professional gamers who use them in pro-level tournaments and then provide us with feedback. Then we iterate on the product, refining it with the feedback – over and over and over again. That's how it's done, that's how a Razer product is built from ground up. No marketing BS and no hype. We pioneered the eSports movement with the world's first $100K tournament back in 2000 and we have continued to give back to the community by sponsoring top eSports athletes who give back to Razer by beta-testing our products. We remain one of the largest sponsors of eSports community sponsoring top global eSports teams worldwide. The people that work here at Razer are gamers just like you – some amateur, some ex-professional gamers, some just play for fun, just ask our CEO who will lay the smack down on you in Quake Live or our President, who has over ten level 80's on his local server. Hell, he will even take you on a raid in the middle of the work day. We are the same gamers who are told by the suits that we need adult supervision and we need a professional CEO or management team – and we're the same gamers who tell the suits exactly where to shove it because we like doing what we do – and we do it on our own terms. We hope our passion for gaming speaks to you like it does to us, through our products and we hope you enjoy the competitive edge we bring to your game." 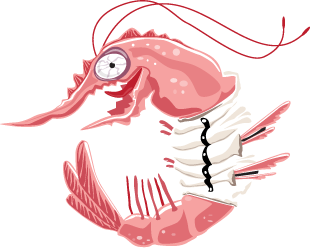 Copyright © 2001-2011 Madshrimps, All rights reserved. All information and graphics contained in Madshrimps are sole property of the Madshrimps crew and may not be reproduced or copied in any manner without written permission from us.